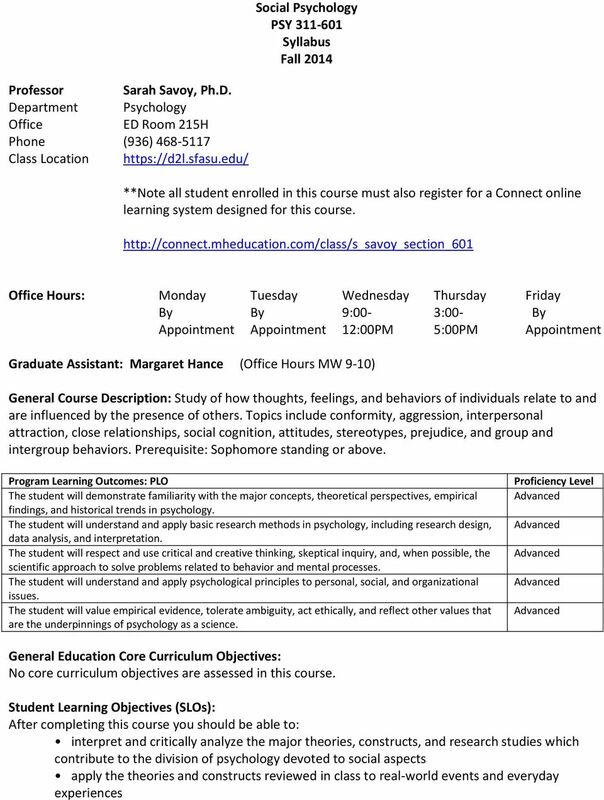 Download "Social Psychology PSY 311-601 Syllabus Fall 2014. http://connect.mheducation.com/class/s_savoy_section_601"
3 Desire2Learn. You will see Reading Reaction discussion sections for each of the articles covered in this course. Please make sure that you are posting your reactions in the appropriate topic. Also, it is very important that you make a serious effort in contributing a unique thought or idea to the discussion forum. In other words, try to avoid simply repeating what your classmates or the author/s of the article have already mentioned. Instead, try to use your own ideas, course terms, and course concepts in discussing your individual interpretation of the study. Be creative! Your idea should be concrete and specific. Avoid vague opinions (i.e., This was a very interesting article or I thought the authors did a great job in conducting this study ). Support any opinions you offer with explanation and either logic or evidence from the article. It should be clear to me that you read the entire article and that you put some thought into your post. The following code system will be used for grading the Discussion posts. Code (what you will see as your D2L feedback) A B C Discussion post error The discussion post offers too vague of an opinion and or the discussion post is not about a specific aspect of the study described in the article and/or it is not clear that you have read the article You are only re-stating what your classmates have already mentioned without adding your own unique interpretation You are only re-stating what is described by the author/s of the article without adding your own unique interpretation. You are not thinking critically. Point deduction D You are not using relevant course concepts and terms in your discussion post. Participation and Professionalism: In addition to posting 4 of your own reading reactions, you must also post follow-up comments or questions to your classmates reading reactions throughout the course. 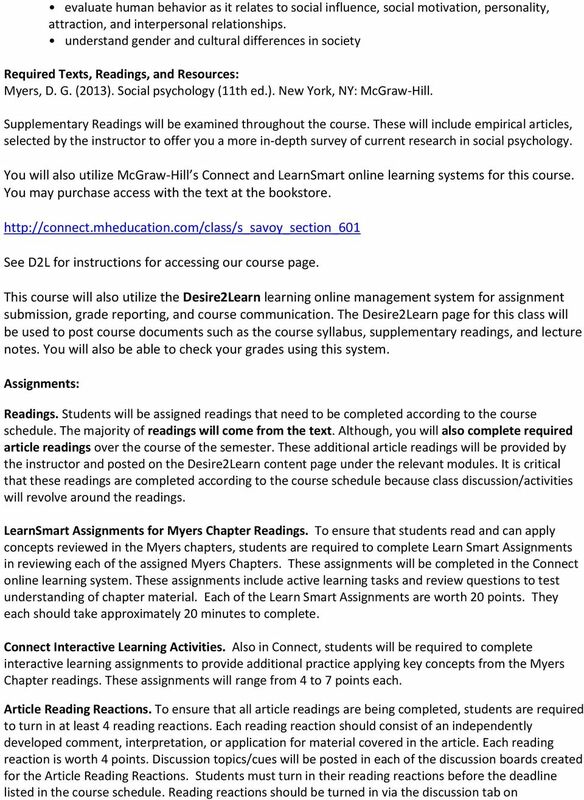 In order to keep up with these discussions, you will need to check the Desire2Learn course page regularly over the course of the each week of the semester. This is how you will earn participation points in the class and contribute to the class learning environment. You will also be expected to complete online quizzes, learn smart assignments, and reading reactions on time and respect your classmates in discussion forums. This is how you will earn professionalism points. 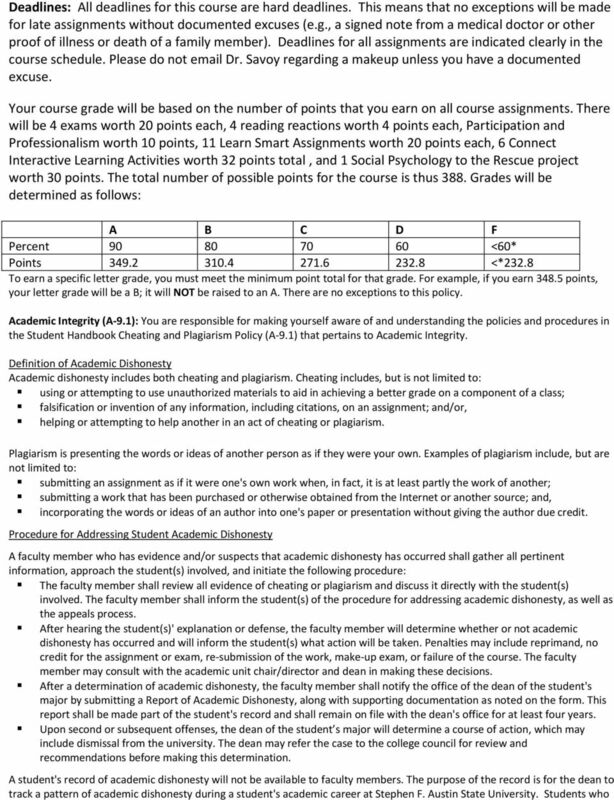 Participation posts and your professionalism throughout the course will be worth 0 points. Social Psychology to the Rescue Projects. Each student will develop their own Social Psychology to the Rescue project, designing a program or public campaign to address a social problem (e.g., littering, prejudice, overeating, sedentary behavior, recycling, conservation, depression, binge drinking, texting while driving). Over the course of the semester, students will complete self-paced research online and in the library. At the end of the semester each student will turn in a 3-5 page double spaced word documents (2-pt font). 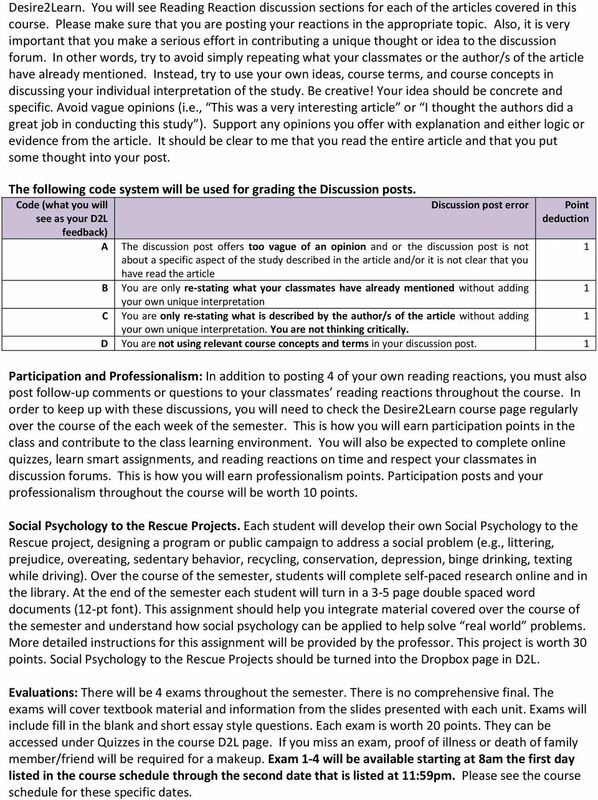 This assignment should help you integrate material covered over the course of the semester and understand how social psychology can be applied to help solve real world problems. More detailed instructions for this assignment will be provided by the professor. This project is worth 30 points. Social Psychology to the Rescue Projects should be turned into the Dropbox page in D2L. Evaluations: There will be 4 exams throughout the semester. There is no comprehensive final. The exams will cover textbook material and information from the slides presented with each unit. Exams will include fill in the blank and short essay style questions. Each exam is worth 20 points. They can be accessed under Quizzes in the course D2L page. If you miss an exam, proof of illness or death of family member/friend will be required for a makeup. Exam -4 will be available starting at 8am the first day listed in the course schedule through the second date that is listed at :59pm. Please see the course schedule for these specific dates. Psychology 415 Spring Semester 2011 Psychological Tests and Measurements PSYC 415-01 Psy Tests/Measurements, 3.00, M, 0630-0910 White Hall Room 103 Lilly, J.; Prerequisite PSYC 101 James E. Lilly, Ed.S.